159*. Каплан И. Г., Симметрия многоэлектрониых систем. — M.: Наука, 1969. 160*. Lepard D. W., Сап. J. Phys., 44, 461 (1966). 161*. Lord R. С., Merrifteld R. E., J. Chem. Phys., 20, 1348 (1952). 162*. Louck J. D., Galbraith Н. W., Rev. Mod. Phys., 48, 69 (1976). 163*. Meal J. H., Polo S. R., J. Chem. Phys., 24, 1119 (1956). 164*. Michelot F., Bobin B., Moret-Bailly /., J. Mol. Spectrosc, 76, 374 (1979). 165*. Mills I. M., Vibration-Rotation Structure in Asymmetric and Symmetric Top Molecules, в кн. Molecular Spectroscopy: Modern Research, vol. 1, p. 115 (cds. K. N. Rao, C W. Mathews), Academic Press, New Journ., 1972. 166*. Mills I. M., Watson J. K. G„ Smith W. L., Mol. Phys., 16, 329 (1969). 167*. Moret-Bailly J., Cah. Phys., 15, 237 (1961). 168*. Moret-Bailly J., J. Mol. Specrosc, 15, 355 (1965). 169*. Nielsen H. H., Rev. Mod. Phys., 23, 90 (1951). 170*. Oka T., J. Chem. Phys., 47, 5410 (1967). 171*. Ozier I., Phys. Rev. Let., 27, 1329 (1971). 172*. 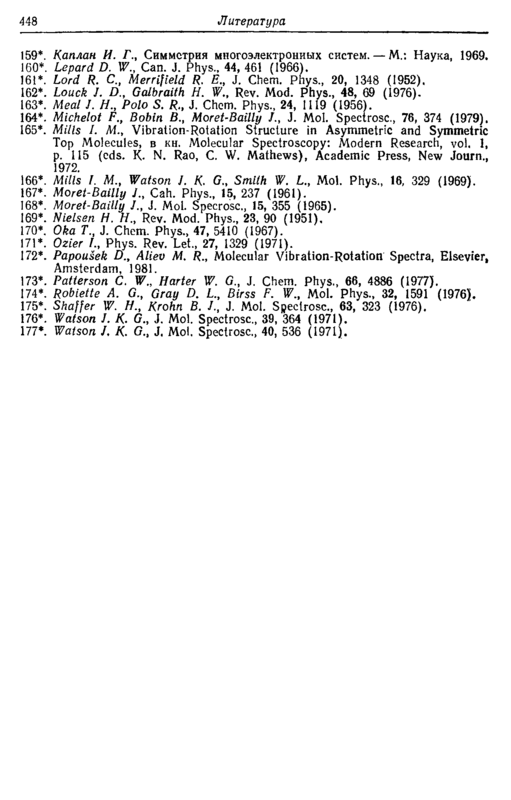 Papousek D., Aliev M. R., Molecular Vibration-Rotation Spectra, Elsevier, Amsterdam, 1981. 173*. Patterson C W., Harter W. G., J. Chem. Phys., 66, 4886 (1977). 174*. Robiette A. G., Gray D. L., Birss F. W., Mol. Phys., 32, 1591 (1976). 175*. Shaffer W. H., Krohn B. J., J. Mol. Spectrosc, 63, 323 (1976). 176*. Watson J. K. G., J. Mol. Spectrosc, 39, 364 (1971). 177*. Watson J. K. G., J. Mol. Spectrosc, 40, 536 (1971).